seen here, but it doesn't compare to Ken's. Note the glazed-over look in his eyes. 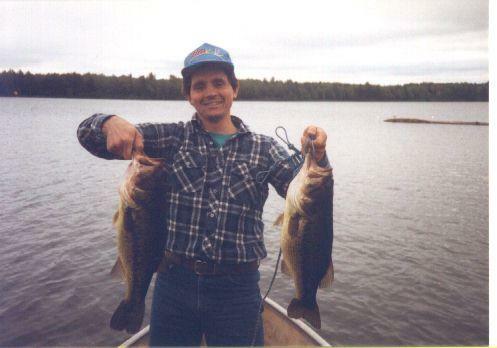 I can't say I blame him, it's like a dream to be holding two bass that big. Note also the picture of him releasing one of them. He did let them both go, but only one picture. I think if it was me one of them would be mounted on my wall. It's a good lake. We were catching walleyes in the middle of the afternoon while trolling with (I think) a 9.9 hp gas outboard! Ken's brother-in-law was catching them on Little Sizzlers sausages. It's funny how the fish don't know to be wary of odd-looking baits and gas motors, but there's no traffic on the lake and the only people who fish it are the people who live on it. This was years ago, but I just was looking at the pictures recently and thought it would be fun to put a couple up here. Peace out. Thanks for reading my post. Cool car. I would give anything to catch a pike. 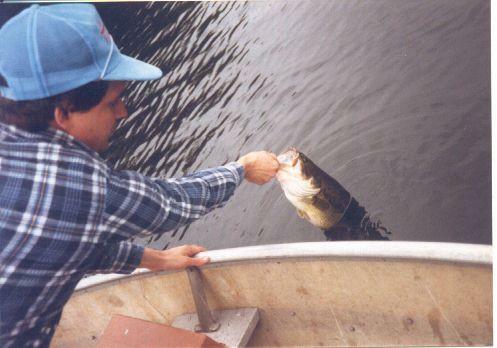 I've wanted to catch one of those fish ever since I was a little kid. I read your (sinner or saint) post. I agree 100%. I just wanted you to know for now that I got your message. I'll get back with you before to much longer. Whaddya mean "yum"? They're fish bait you goofball! Nobody would eat the bait. Just kidding. Thanks for dropping by, Clint.